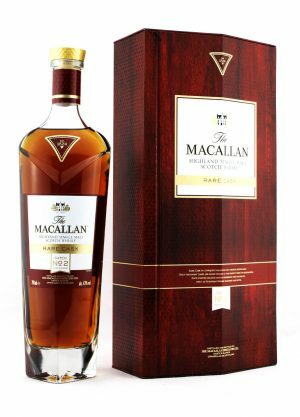 Macallan 40 year old, 2017 release. ‘Exclusively matured in hand crafted sherry oak casks from Jerez, Spain’. Sultanas, ginger, wood spice, citrus. Limited Edition: 465 Bottles Produced. Approx. Shipping Weight: 3.0 kg. Nose: Sultanas with gingers and wood spice. A background of sweet cinnamon and citrus emerges. Palate: Opens with soft cinnamon spices, quickly developing into a mouth coating of date and figs. Finish: Long, rich with a lingering cinnamon spice. In 1824, the distillery was licensed to Alexander Reid, but started life as the Elchies Distillery on 6 acres of rented ground. The estate now covers 390 acres of which 90 acres are sown in the spring with their own exclusive minstrel barley variety to make the whisky. The river Spey, one of Scotland’s most famous salmon rivers, borders the estate to the south and south-east.